I didn’t know that Veritas was going to do this! I already have a tongue and groove plane. I’m trying to decide if I’d ever need to cut a 1/2″ groove. Veritas planes are very good tools and reasonably priced, but I think you could get an old Stanley 45 with a set of cutters for much less than this plane and all of the accessories. Grooves can be used for drawer bottoms and shelves just to name a few uses. You know, I’ve never really looked at combination planes. Sounds like a really good idea. It seems like the wider the groove the harder it would be to keep the keep the plane (and the bottom of the groove) level. If you ever need to cut a wide groove you could probably do a nice job with a shoulder plane and a temporary fence clamped to the part. I haven’t used a combination plane, but for me part of the joy with hand tools is picking them up and knowing they are ready to go without any tweaking. A combination plane would mean changing blades and adjusting the alignment and depth of cut — not a big deal, but not as fun as picking up a dedicated plane, cutting the feature and putting it back. Yeah, I made that mistake already .. I started looking .. on ebay. They’re very cool and not that expensive .. but I don’t need one cuz I have the Veritas plow plane already. And I agree, I bet cutting with the 1/2″ blade would be tough. I struggled at first with the other sized blades, but I think I have the hang of it now (not to big-a bit). I think the 1/2″ would be best used for a back panel dados. I’ve been cutting these lately as a stopped dado, but have cut through dado. And I think I’ve seen Shannon cut a stopped dado with a plow. I *knew* you could do it! A combination plane is just a plough/plow plane with some extra bells and whistles. 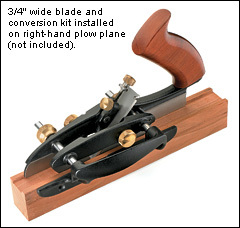 Plow planes can cut dadoes and rabbets much bigger than 1/2″ with a good technique. Chris Schwarz has a good article in the June 2012 issue of Popular Woodworking magazine on these useful tools. It is the only article on these planes I have seen in many years. Chris’s method is the one I learned many years ago. So long ago I can’t remember where I learned it. Joe is right about having dedicated tools for specific jobs. This is the way to go if you can afford the tools and the space. This is why I have the Record 043. I use this plane solely for cutting dadoes for drawer bottoms. Actually I have it because it is the cutest little plow plane I have ever seen and I would have it even if I never used it! Ewww! You’re right! So cute! Setting up for a dedicated use is a wonderful idea too. And I saw that article that Chris wrote. If I’m able, I’ll add it to the post.